In 1948, Frida's health condition has been deteriorating and this self-portrait is the only painting she painted in that year. 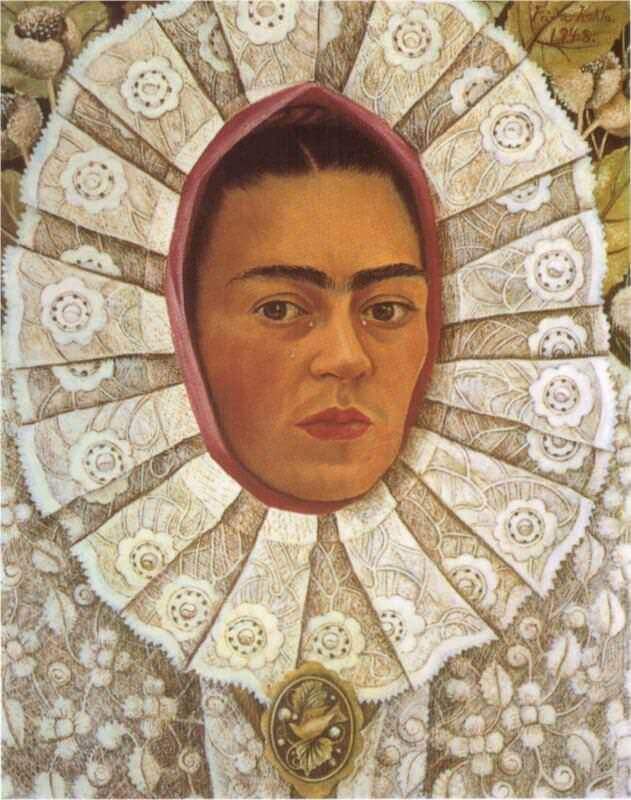 In this portrait, she is wearing the traditional Tehuana costume which Diego Rivera admired a lot. But her lace ruff are taking up all the space and she seems get trapped in there. Her face looks calm and emotionless but there are tears on her face. Her signature slight mustache makes her look more obviously masculine. This painting was commissioned by her dentist and personal friend Dr. Samuel Fastlicht. Frida has been using her paintings to pay lots of expenses in her later years. In a letter to Dr. Samuel Fastlicht, Frida Kahlo apologized for taking so long to paint this painting because of her long-lasting physical pain. She wrote: "This whole mood is naturally reflected in my self-portrait. Perhaps you won't like it at all..I do like it, because it is the exact expression of my emotions." She asked for a price of $2500 for this painting. She told the dentist that her paintings are now selling for $3000 but he can keep the $500 for the dental service he provided for her. She is also known to pay him with two still life paintings for the dental expenses. Copyright © 2009-Present www.FridaKahlo.org. All Rights Reserved.